Unfortunately, in today’s India it is becoming fashionable to denigrate Black Money, but I am still waiting to see one. I have always found Indian money not only eye-soothing, but also heart-warming. I have been around and seen currencies of quite a few foreign countries and found them always colorful and attractive - even if not always as eye-catching as Swiss Francs - and have never encountered a black bill. And in any case in India, where money is the embodiment of the beautiful goddess Lakshmi, it amounts to sacrilege to call any money black. Goddess Lakshmi being wife of Lord Vishnu is worshipped with utmost devotion in our houses. And this devotion is often exhibited in direct proportion to the Lakshmi’s krupa one enjoys. Therefore, people flush with gold make offerings of tens of kilos of gold in temples without even disclosing their identity. Non-disclosure of one’s identity proves to be a multipronged strategy- Lakshmi becomes more prasann and bestows more krupa because gupt-dan is of higher degree, and the ‘hounds’ of Income Tax department fail to connect this wealth with the real treasure stashed in the lockers of banks or plainly inside some quilt to make it a more effective-warmer. Media is having whale of a time through hullaballoo on bringing back the black money from tax-haven countries. It is also helping in good measure many social activists to spring up like frogs in the rainy season. However, most of us fail to realize one simple truth that we Indians may not be as attached to mundane acquisitions as the indulgent westerners, but we can never be faulted about our perseverance in ‘by hook or by crook’ pursuit of Lakshmi, and ingenuity in safeguarding ourselves from the ‘hounds of law’ who try to poke their nose in that ‘pious’ pursuit of ours. In police parlance the latter is called Peshbandi - which means to take measures in advance to protect oneself from consequences of one’s misdeeds. All those who have the means and resources to earn black money and stash it in foreign banks have already created an insurmountable ‘China Wall’ against the forces of law. 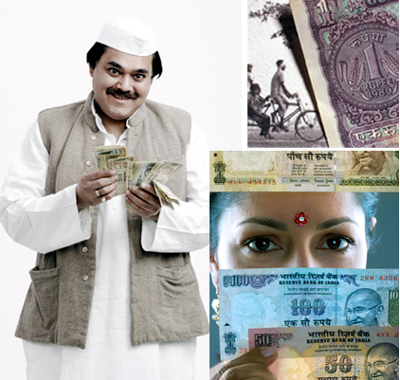 The loot that results in creation of so-called black money is mostly of governmental funds. This is performed through non-payment of customs-duty, trade tax and income tax, inflating bills in governmental expenditure, and outright embezzlement of cash and goods meant for public distribution. And all this is done with impunity through a nexus among politicians, bureaucracy, trader class and adjudicators. How all these have taken measures to protect themselves from the clutches of law can be a lesson for the best of management Gurus. It is natural to expect that in a democracy the law on corruption should be of universal applicability and should not differentiate between the poor and rich, powerful and week, neta and janata, and judge and judged. However, the ground realities given below, are totally opposite of such an assumption. Political leaders can rightfully accept any ghoos in the name of donation to their party, which in the absence of any accounting is gleefully stashed as personal property. Members of Parliament and state legislatures can rightfully accept ghoos for expressing their opinion (vote) in the legislature in any manner- fair or unfair. Mantris can’t be prosecuted without sanction of the President/ Governor, which in effect means ruling party. For any act of commission or omission during discharge of their duties, no government servant can be prosecuted without sanction of appointing authority. Vigilance Directorates and Economic Offences Wings of the states cannot initiate any enquiry/investigation or prosecution without sanction of the government (read I. A. S. officers and ministers). No search can be made in the house/office of an officer of the rank of Joint secretary and above, without the permission of the government. No trap for taking bribe can be laid against a gazetted officer without permission of the government. No search, trap or prosecution of a judge/magistrate is allowed without permission of higher judiciary. So far as industrialist/trader/neta is concerned, any laws of misdemeanor or corruption hardly apply. If cornered by disclosure of billions of rupees stashed away, the powers that be, are ever-ready to oblige them by framing rules for turning blind eye towards their crimes in amassing wealth and treating it as merely a case of tax evasion. And more obliging governments also officially turn their black money into white after charging a small amount of penalty. So in our country of Lakshmi worshippers there is little chance of my having darshan of Black Money. Ravindra Malhotra Ji- Aap ki kavita ke kya kahane. Sab kuchh kah dala hai. Mubarak. Dr. Gopal Singh Ji- Thanks for reading, agreeing and commenting. Well said Mahesh. In this context I had penned a poem in hindi titled "Ulluon Ka Basera "
Inki maili chadar dhota ye is desh ka babu sarkari hai"
We have to understand that the “Ruling Class” has put the system in place to shield itself from any outside scrutiny as it shamelessly indulges itself in the process of corruption. No where in the world this shield is so deliberate and bulletproof as in India. on the Back Burner in the Parliament?” I mentioned that the JPC probe is almost a meaningless exercise so long as the current regulations shielding the culprits stay in effect. You cannot eliminate the grass by mowing the lawn over and over. The turf itself has to be removed. Instead of (or in addition to on a higher priority basis) JPC probe, the parliament should be drafting new legislations and voiding the existing loop holes pointed out in your article. Of course that is not in the selfish interest of any of the parties involved including UPA and NDA. Therefore, conveniently nobody thinks of such reforms. The corruption is built and nurtured in our system of government.